There is further evidence today of the dual nature of Britain’s counter-insurgency war in Ireland, the use of regular and irregular forces, with the publication of an official investigation into the Loughinisland Massacre of June 18th, 1994. On that date members of the Ulster Volunteer Force (UVF), a pro-UK or unionist terrorist faction, entered the crowded Heights Bar in the mainly nationalist village of Loughinisland, County Down, where the TV broadcast of a late-night soccer match between Ireland and Italy in the FIFA World Cup was being shown to customers. One of the gunmen, armed with a VZ. 58 automatic assault rifle, shouted “Fenian bastards!” before opening fire on the festive gathering, killing six elderly or middle-aged individuals and wounding five more. Among the dead were Barney Greene (aged eighty-seven), Daniel McCreanor (aged fifty-nine), Malcolm Jenkinson (aged fifty-two), Eamon Byrne (aged thirty-nine), Patrick O’Hare (aged thirty-five) and Adrian Rogan (aged thirty-four). “…an understanding of what happened at Loughinisland begins with the importation of arms by loyalist paramilitaries in late 1987/early 1988. My investigation has found that the VZ58 rifle which was used in the Loughinisland attack was part of the shipment which entered Northern Ireland at that time. I examined intelligence which showed the passage of a VZ58 into the hands of those, who were suspected of undertaking the murders. My investigation into the Loughinisland killings examined the events leading up to the murders. It found that Special Branch had reliable intelligence that there was to be an arms importation in 1987/1988. Moreover, reliable intelligence indicates that police informants were involved in the procurement, importation and distribution of these arms. The failure to stop or retrieve all the weapons, despite the involvement of informants in the arms importation was a significant intelligence failure. “My conclusion is that the initial investigation into the murders at Loughinisland was characterised in too many instances by incompetence, indifference and neglect. This despite the assertions by the police that no stone would be left unturned to find the killers. My review of the police investigation has revealed significant failures in relation to the handling of suspects, exhibits, forensic strategy, crime scene management, house to house enquiries and investigative maintenance. The failure to conduct early intelligence-led arrests was particularly significant and seriously undermined the investigation into those responsible for the murders. “There were many examples of failures to pass on intelligence to investigators. This meant that investigative lines of inquiry were not followed and individuals, who might have been subject to detailed and robust investigation, were effectively excluded from consideration. In the case of the incidents prior to the Loughinisland murders, limited action was taken against the UVF unit suspected of a series of serious crimes. The police also had intelligence that in August 1994 the murder suspects were warned – by a police officer – that they were going to be arrested. involved in a range of activities, including command and control of loyalist paramilitaries; the procurement, importation and distribution of weapons; murder; and conspiracy to murder. They have not been subject to any meaningful criminal investigation. It is of particular concern that Special Branch continued to engage in a relationship with sources they identified in intelligence reporting as likely to have been involved at some level in the Loughinisland atrocity. “The principal firearm attributed by the RUC to the murders at the Heights Bar was a VZ58 assault rifle. PSNI ballistic records indicate that VZ58 assault rifles were used by loyalist paramilitaries in the murder or attempted murder of at least 70 people in Northern Ireland between 7 March 1988 and 3 May 2005. Many of the weapons are believed to have arrived in Northern Ireland in late 1987 and to have been distributed among various loyalist paramilitary groups. Considerable controversy has surrounded the origin of these firearms. The importation of munitions from White-minority rule South Africa in the late 1980s, via the Lebanon, to rearm the militant unionist organisations is examined in some detail. These groups included the Ulster Volunteer Forces (UVF) and its occasional rival, the Ulster Defence Association-Ulster Freedom fighters (UDA-UFF), a quasi-legal UK terrorist movement from 1971 to 1992. Notably they also included the Ulster Resistance (UR), an extremist faction founded in 1986 by the Reverend Ian Paisley, leader of the Democratic Unionist Party (DUP). 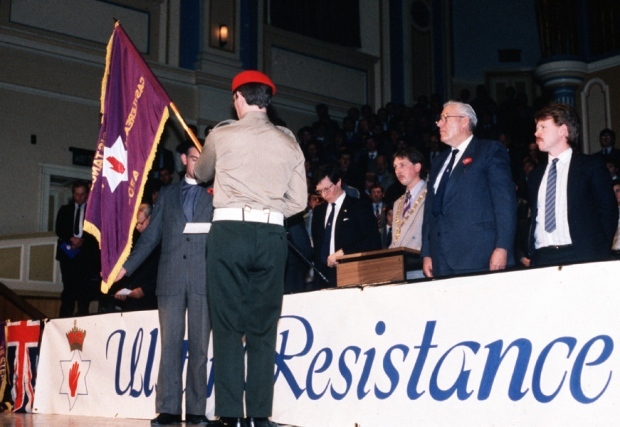 Until the early 1990s the UR effectively operated as the DUP’s unacknowledged military wing replacing previous ad hoc organisations like the Ulster Clubs and the Third Force. “At the time of the importation of the firearms and subsequent receipt of intelligence in 1990, the RUC had informants in senior positions of some of the Loyalist Paramilitary Organisations involved. One of those sources was named in the intelligence as being involved in the importation. UDA was also named as being party to the negotiations. By early October 1987, information had been received by the police that most of the funding, which had recently been acquired from the robbery of the Portadown Northern Bank had been deposited in a foreign bank account. International arms dealers were to deliver the weapons to a location in England or Scotland. The purchases were to include hand grenades, rocket launchers with rockets/missiles, handguns (number/calibre not specified), AK47 assault rifles (number not specified) and UZI submachine guns. The rocket launchers were to be used against police/military landrovers. In a document dated 21 October 1987, written by a Detective Chief Inspector attached to Special Branch who declined to assist my investigation, it was reported that ‘support for the Ulster Resistance (is) likely to be rejuvenated upon procurement of the firearms’. “‘In the mid-1980’s, the Security Service received intelligence that an unnamed and potentially very senior RUC officer might be assisting loyalist paramilitaries to procure arms. I should note that this arms procurement appears to have been unsuccessful and was unrelated to the separate partially successful importation of arms by loyalists in late 1987/early 1988. …I consider that the documentary record as a whole does suggest that it is likely that a highlevel RUC contact assisted loyalist paramilitaries to an extent in their efforts to procure arms in the mid-1980s. The FRU and Security Service reports from the period 1987-89 also suggest that a small number of senior police and Army officers may have been providing assistance to loyalist paramilitaries. Reliable and repeated reports covered comparatively senior officers in the RUC through to senior officers in the UDR, though such individuals were not always identifiable on the basis of the intelligence that had been received. Several Security Service reports in the summer of 1988 suggested that an individual centrally involved in the loyalist arms procurement in the late 1980s received assistance from contacts in the RUC and the UDR. …the intelligence reports pointing to assistance being provided by a small number of comparatively senior figures are sufficiently compelling and consistent to lead me to believe that at least some of the reports are likely to be founded in truth. “The evidence of Police Officer 3 suggests that security forces in the Newcastle Sub-Division had been compromised, principally from the UDR but also from within the local RUC, through either direct involvement with loyalist paramilitaries, associations or sympathies. “…remarkable dedication, professionalism and courage of the Royal Ulster Constabulary and the Armed Forces. Over 1,000 members of the security forces lost their lives over the period of Operation Banner – the longest continuous military deployment in our country’s history. Yet today we face a pernicious counter narrative. It is a version of the Troubles that seeks to displace responsibility from the people who perpetrated acts of terrorism and place the State at the heart of nearly every atrocity and murder that took place – be it through allegations of collusion, misuse of agents and informers or other forms of unlawful activity. I am not going to say that over a period of thirty years there were no instances where members of the police and armed services fell below the high standards we expect of them. But to suggest that misconduct by the police and our Armed Forces was somehow rife or endemic is, in the view of this Government, a deliberate distortion and a narrative of the Troubles that is not justified by the facts. Of all the deaths that occurred during the Troubles, 60 per cent were caused by republican groupings, 30 per cent by loyalists, and 10 per cent by the State. But over 250,000 men and women served in the RUC and the Armed Forces in Northern Ireland during the Troubles. Yet reports like today’s by the “Police Ombudsman” give further evidence to the belief that the pro-UK terrorist factions were without doubt both necessary and integral to Britain’s thirty-year counter-insurgency struggle with the (Provisional) Irish Republican Army and others. The RUC, UDR, UDA-UFF, UVF and UR formed part of a near-seamless paramilitary machine alongside the conventional military units of the British Armed Forces. They complimented each other in a dual track strategy to combat the republican resistance in the north-east of Ireland. The 40% of killings attributable to what we can only describe as the British Occupation Forces, the vast majority entirely civilian in nature, stand in stark contrast to the deaths attributable to the Irish Republican Army, the majority of whom were combatants. The pernicious narrative being countered, the one being proved false by the passage of history, is that of the United Kingdom of Great Britain. Truth brings its own victory. 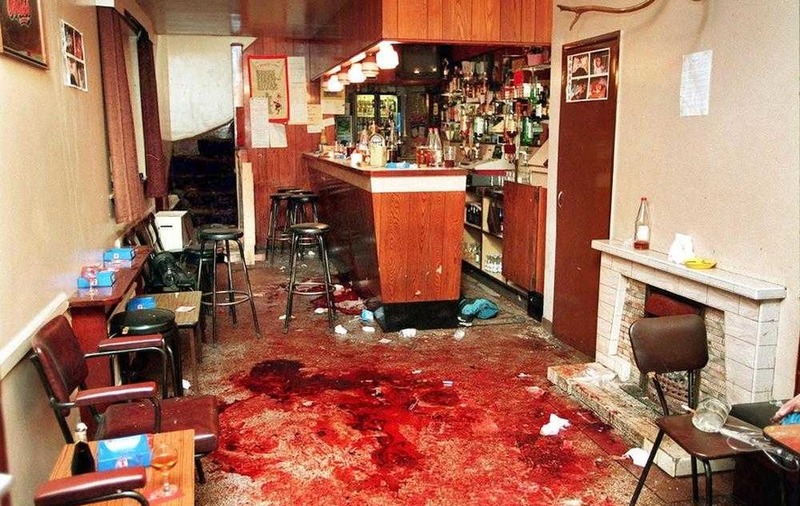 You can read the full report in PDF through this link, “THE MURDERS AT THE HEIGHTS BAR, LOUGHINISLAND ON 18 JUNE 1994“. The Guardian article is simply awful. “Dozens of murders ” as per the headline. More like about 230 murders were done by these South African weapons alone.So why can’t they bring themselves to write this??? It mentions this killing occurred after the INLA killed three UVF types. Would the Guardian mention that Kingsmills was done after the Reavy and O’Dowd killings?? Another sop to the British State. Not Terrorists then… Definately not. The Guardian is a full on apologist for British terrorism in Ireland. They have signed up to the British State narrative. No surprises there.. since when the SIS (Brit secret services) came calling for the Snowden files the guardinstas handed them over too. Alas throughout these shocking,cough cough, revelations the narrative being fired out now is, the terrorist police force was ‘involved in collusion to protect informers’. Absolute rubbish. They were involved in a straight counterinsurgency campaign designed to strike terror into the wider nationalist community. Protecting agents had nothing to do with it. Getting agents and thus directing them into the preferred policy of the British state was why they didn’t apprehend anybody. well done for a clear report and analysis Seamas. However irish citizens are mal-treated under both governments, as shown by the latest UN report on abortion status in the Republic. and on the same day, two former British warlords in Chief aka John Major and Toni BLiar giving lectures in the wee 6 about Brexit and possible break up of UK. These people have no shame whatsoever. Preaching about preserving a State that sponsored terrorism. They should be preaching to spare their necks from a dock in The Hague, International Criminal Court. to be on the receiving end. Do them some good.. I should say. That was an odd visit to Derry, wasn’t it? Yes.. I must say I was disappointed. I knew TB was an arch unionist..didn’t think John Major was. I wonder in terms of the wee 6 when there will be a non unionist British PM. Jeremy Corbyn seems the closest thing so far But a Tory one in future would be a nice development. Corbyn just doesn´t ´get´ Scottish nationalism, even now when Labour MPs north of the border have been all but eliminated. He´s as much a ¨unionist socialist¨ as Major etc. are ¨unionist Tories¨. As for Tory involvement, the referendum from their POV is primarily an internal power-struggle. Admittedly JC might be glad to get shot of NI (well who wouldn´t!) but then Labour has never stood there, so nothing really to lose. Basically this is a Westminster thing, sorry but it´s not about you at all, NI just provided a nice evocative stage set for them to grandstand. Isn´t that just what states do? Once you have a power hierarchy you have privilege, something people will do whatever it takes to hang on to. Openly or covertly, by fair means or foul?